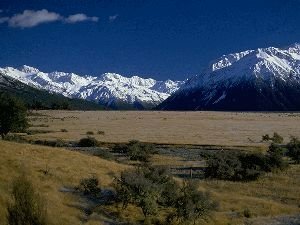 Photo opportunities exist in all sorts of places in Arthur's Pass National Park, whether it be the alpine landscape, wildflowers or wildlife, or the awesome weather we experience on occassions, there can be always something to photograph. 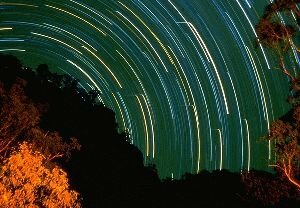 On crisp spring nights (with no moon) try to create a star trail photo. To find celestial south (the axis point of the earth's rotation), point the camera magnetic south, then raise it up 30º to the horizon. This is best done in an area of no civilisation (the Crow or Hawdon Valleys are good sites because they point north/south). Mount the camera on a tripod, close the aperture right down, use a lockable cable release, set the camera to 'B' then trigger and lock open the shutter for the desired time. 100ASA film works best. Mist & fog in the Waimakariri Valley sometimes creates unique scenes, as does mist low on Lake Pearson. Sunsets tend to be boring in Arthur's Pass, however sometimes before bad weather we get some extreme pink and orange blazes down in the upper Waimakariri Valley (Turkey Flat area). Or brilliant red if bushfires are burning in Australia! Rockclimbing shots at Castle Hill are OK, but try taking photos of climbers whilst there is snow at the base of the climbs, looks great! Snow hung up in the Beech trees always makes for a different photograph. If there is lots of snow about, your colour photos will appear as B/W or cepia. Snow on the roofs of some of the small baches in town slides and curls making for interesting shots. BE DARING, BE ORIGINAL !